Valerie was seven years old when she was diagnosed with kidney cancer (Wilms’ tumors). Immediately she was hospitalized where one of her kidneys was removed and she was given radiation-treatment. For ten months she received chemotherapy. In “A frog in my belly” we read what young Valerie experiences as a child with cancer. Through the eyes of a child we see the unbearable task of her mother to cut the remaining hair of her almost bald head. We witness the powerlessness of her father and the countless, painful injections in her hand. How Valerie literally is fighting against the chemo-pricks because she does not understand that it will make her better. Her worn caps and the bullies on school. But the book also provides insight in the years thereafter, the fear of the cancer returning, the possible unknown after-effects of chemo and radiation, the psychological impact that Valerie’s experiences during her puberty. “A frog in my belly” is the gripping, surprisingly humorous and always hopeful story of a child with cancer. 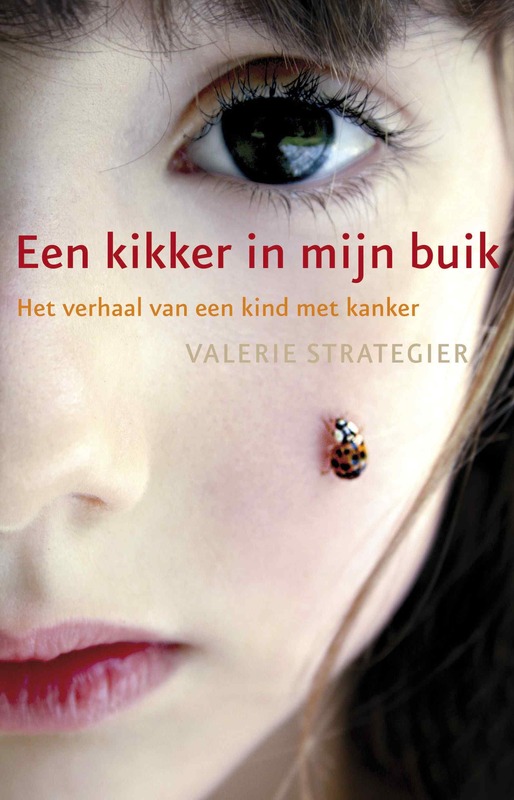 “A frog in my belly – The story of a child with cancer” by Valerie Strategier will be published in Dutch in November 2010 by Uitgeverij L.J. Veen. Click on the image to enlarge the cover.